I did go a little crazy with my make-up too. I was in a mood when I woke up so I decided to go for it because normally my make-up is so reserved to browns, gold and pinks. 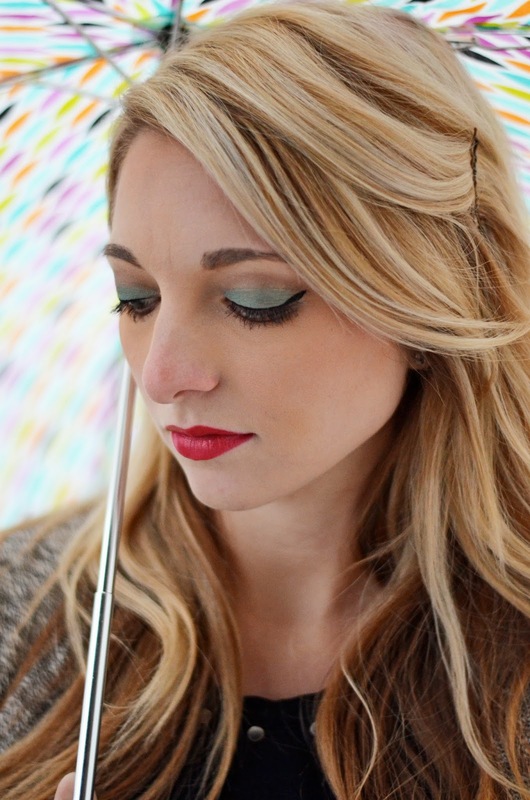 Nothing like an emerald eye and bright red lip to switch things up a bit! Oh Jana, can we agree she is just a classic beauty? And our co-host Bridgette seriously makes her outfit look effortless. Those shoes = heart eye emoji! See their posts for full outfit details. Can you believe it's already time for February prompts? Gosh this gets me so excited! There are truly some fun prompts up ahead. Jana and I really hope you'll join in and spread the word! 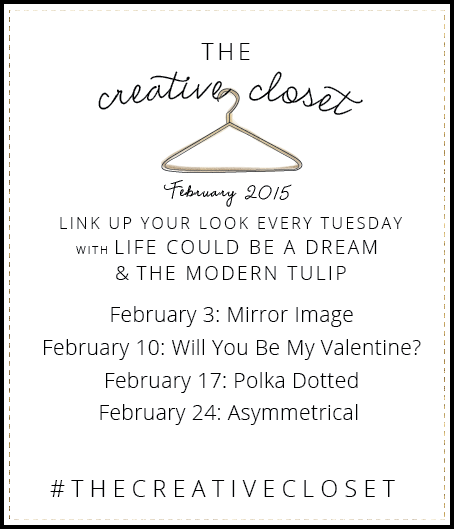 20 comments on "The Creative Closet || Beauty In Black And White"
LOVE LOVE LOVE your graphic tee. And so perfect as a maternity top! You look adorable with that umbrella. Pretty confident that I would not have thought to do that but I would have just been like ugh, the rain... we can't take pictures. Now I'm gonna remember that if the weather doesn't cooperate, I can just work a fun prop into it! 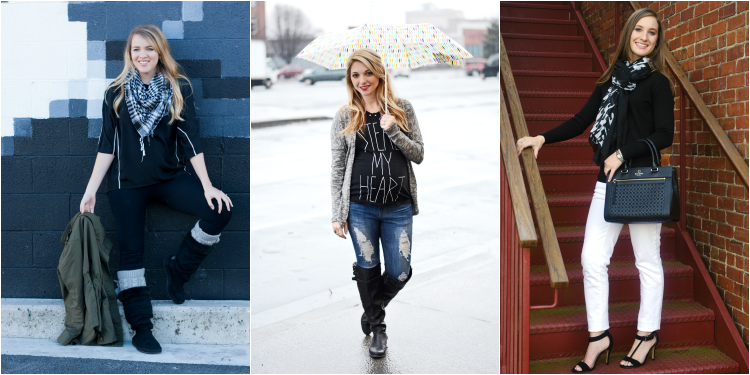 Black & white never gets old, and I love the look of a graphic tee dressed up a little. Your eyeshadow looks so pretty! oh I just love this outfit!! Super cute! Your makeup look gorgeous in these photos - you need to break outside your comfort zone more often! I'm super excited for some of the prompts for next month ... I'm sure I'll be joining you ladies for at least a couple. Can I hire you to come do my makeup every morning? Puhhleeassee? Such an adorable tee, and I love your pretty umbrella too! What a cute T and I LOVE that cardigan! I second what Nina said--black and white and cute all over! Love when casual is super stylish! Great way to combine the two! Your makeup is on point girl! Love the more casual look!! So pretty! This is such a great casual look. You always look so great! that top is so much fun! and you look amazing in the rain haha my hair would be a mess! These are fantastic photos - the bold makeup looks great! 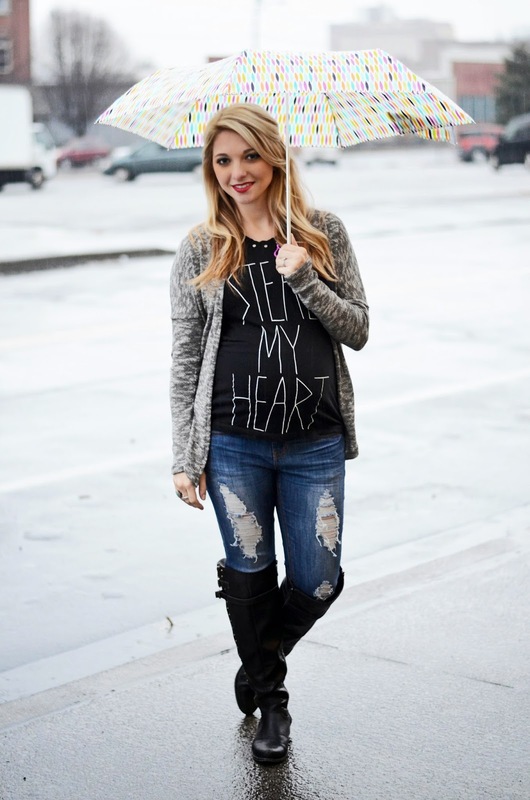 I love the tee with the ripped jeans, and the umbrella is just too cute!